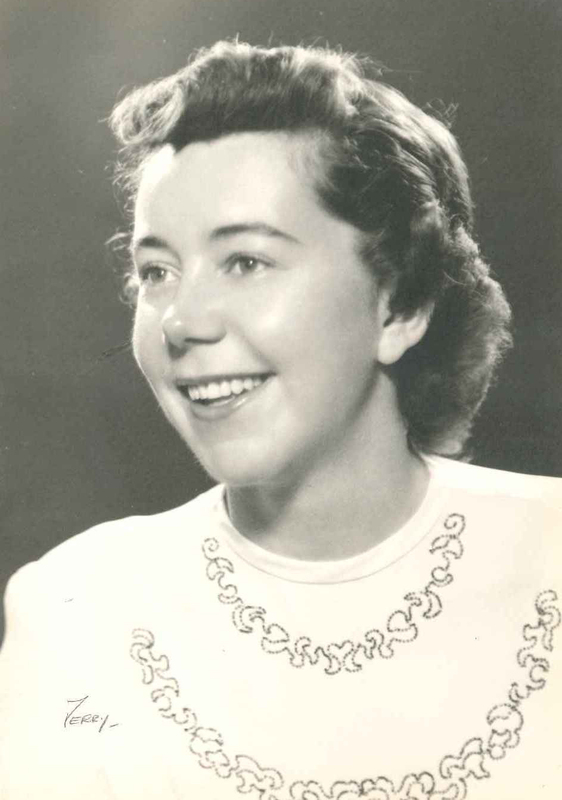 Frances completed a Bachelor of Science in Engineering Math in 1947 and a Master of Science in Math in 1951. In addition to raising her two daughters, Frances worked as an aeronautical engineer, an engineering instructor at the University of Toledo, and a high school math teacher. Listen to Frances describe her family and how she became interested in engineering. KW: So, I guess to start off could you tell me a little bit about your childhood? What was your family like? FH: I had one sister. I lived in Big Rapids, which is north of here. And my father owned and operated a hotel, so I was born and raised in a hotel. It was fun. After I graduated from high school, I went to Stephens College, which was then a two year girls' school, now a four year school. KW: Is that in Michigan as well? FH: Missouri. Columbia, Missouri. So, after I graduated from Stephens, I came to Michigan and decided to go into engineering. KW: When did you become interested in the sciences and engineering? When you were younger or more at the college age? FH: More at the college age, when I was at Steven's, that's when I decided to look into engineering. KW: What exactlly led you in the direction of engineering? FH: Well I like math and I like the sciences. Listen to Frances discuss enrollment, living arrangements, her family's reaction, and her classmates at U of M.
KW: So, you started engineering at Michigan. What was the application process at Michigan? Do you remember applying? FH: No. My sister was engaged to the son of Assistant Dean of Engineering and he encouraged me to enroll. So, I just enrolled. There was no application process then. FH: I lived in the Chi Psi lodge. Do you know where that is? FH: This was during the war, so there weren't any boys there. KW: What were your female roommates and housemates studying? FH: I think mostly English and Education. KW: Were your friends and family excited that you were going into Engineering at the University of Michigan? KW: Did they want something else for you? FH: No, they thought, "That's very nice Frances, go ahead and try it." So, I did and I enjoyed it. It was hard and it was hard being in classes with all boys. KW: So, it was mostly all males in your classes? KW: So, how did they treat you? FH: Very well, just indifferently. We didn't talk I don't think. KW: One of the women I interviewed kind of expressed that she sort of felt that she had to prove herself to her male classmates before they would treat her with the same respect. Did you ever feel that way at all? FH: No, I didn't. I didn't feel that way. They were all very shy. So was I, so that was the end of that confrontation. Listen to Frances talk about campus life and her favorite activities. KW: What kind of things did you like to do on weekends or when you had days off here in Ann Arbor? FH: I think just homework. KW: Yeah, that's kind of what it's like now. Did you go to any football games? FH: Oh I went to all the football games, yeah. KW: What were they like back then? FH: Just like they are now. KW: Were the fans pretty crazy? FH: No, no. The fans weren't so outstanding as they are now. No, it was the students who were more active. KW: What were you close friends like? FH: Well, I joined a sorority, so most of my close friends were in the sorority. And the woman I roomed with I started out in kindergarten with, so that was a good backup. KW: Oh wow, do you guys still keep in touch now? FH: Oh yes, we're like sisters. And I joined the sorority that my sister was in, so that was pretty well set up. KW: If you guys did have any free time what did you like to do around Ann Arbor? FH: We did some bicycling, and spent a lot of time walking in the Arb, and went to the movies. KW: Yeah, the Arb is really beautiful. I lived near there my freshman year. FH: Yeah it is. Oh where did you live? KW: So, did you live in the sorority house the whole time you were at the University of Michigan? FH: No, not the first year, but after that I did. KW: Where did you live your first year? FH: At the Chi Psi lodge. KW: Oh yeah, because we were talking about how close it was to me. Were you involved in any other organizations on campus? FH: Just the sorority and engineering. And I was in the Society of Women Engineers. KW: What was that like? What did you guys do? FH: We didn't do much. We tried to set things up. I was president, but we didn't really do much. They do a lot now. Listen to Frances discuss the impact World War II had on her experience at U of M.
KW: Can you tell me, were there any memorable events around campus or around Ann Arbor that you remember in particular or any big happenings or things that stuck out to you? FH: No, I just remember when the war ended, that was a big event of course. KW: What was it like on campus, the attitude about the war? FH: Well, the boys, some of the boys in particular, didn't want to get sent to the Army or get sent overseas. So, they were very worried about getting good marks in school. So, it made competition a lot harder. KW: Oh really, that's interesting. Were there any other changes on campus, you would say during the war, either at U of M or at Stephens? FH: Well, there were all sorts of war activities like knitting scarves and all of that stuff. KW: Okay, did you do any of that? FH: Oh, yeah. I did a sweater. KW: Did they send it overseas? KW: That's neat. When the war ended what was it like on campus? Were there celebrations? FH: Oh it was a terrific celebration. It was really a huge celebration. KW: What was it like? FH: Just raucous. I can't really remember any specific event, but it was wild. KW: Wild? People were pretty excited? Aw, that's great. Listen to Frances describe her interactions with her male classmates and professors. KW: Can I ask you a little bit about your classes? So, you said your male classmates were kind of indifferent to you overall. FH: Well, they were very shy. KW: So, would you say you had a lot of interaction with male classmates? KW: What about things like study groups like today? Did you usually do your work alone then? FH: I worked alone. I was in just one study group and that was good. I was thrilled to be asked to be in it. KW: Were there males in it? FH: They were all men, yeah. But I think they just wanted to have the group meetings over on the front porch of the sorority house to meet more girls. KW: How were the professors toward you? How did they treat you? FH: About fifty-fifty, some were good and some were horrible. KW: Oh really, can you give me an example? FH: Well, my Chemical Metallurgy professor said I should be studying a cookbook, not chemical metallurgy. KW: Did he say that to your face? What did you say? FH: Yeah. I said, "too bad". KW: What about the good professors? FH: Oh, they were very nice. They offered to help me if I wanted to come in after school. FH: Well, it was probably seventy-five, twenty-five, twenty-five bad and the rest good. KW: Can you tell me about some of your classes? Did you have a favorite class? FH: Well, they were all different. I couldn't begin to evaluate them as quickly, I can't even remember most of them. KW: Well, can you tell me about any of them that you do remember or that stick out to you? FH: Oh, yes. I had never taken Physics in high school or my first years of college, so I was scared to death about physics and I had this neat professor, he was an older man, and after our first exam, he looked at my test and he said, "Now, Miss Jenkins, you didn't want to put this did you? Did you want to change this?" and I said "Yeah, I do." And so he sort of guided me through it. And I just passed the test. It was my first test in Physics. So, everything was okay after that, but I was so frightened. He was just like a grandfather. KW: Do you remember your classes being pretty hard? FH: Well, they were hard for me. KW: They would be hard for me too. Lots of homework? Did you feel like that's what you would spend most of your weekends on? FH: Yes, lots of homework. KW: So, it wasn't really a big deal being the only women in your classes since the men were shy? Or did you feel out of place, how did you feel? FH: Uncomfortable, but it wasn't any really big deal. It wore off, you know, as the class went on, it was okay. KW: Did you get called on to participate like the males did? FH: Yeah, well, everybody raised their hands, but I never raised mine, but they did call me anyway. KW: How did advisors treat you? You had mentioned in your survey we sent you earlier that an advisor had really inspired you to go on, do you remember that advisor at all? FH: Yeah, Dr. Kuiethe, he was in the aero department and very famous for the work that he'd done, the boundary layer theory, and he encouraged me to go on. KW: So, besides him, did you have any other really influential professors or advisors? FH: Well, along the way, not too many in one year, but every year there was always someone helpful. Listen to Frances talk about her first job after graduation and how it gave her more confidence in her abilities. KW: And then you went back to get your master's then? FH: No, I went to work in California for two years. KW: Can you tell me what that was like? What were you doing there? FH: Yeah. I was working at an aircraft company, lived on the beach, so it was a nice setup. I worked there for two years and then I decided I just didn't want to stay in California, so I came home and entered graduate school in mathematics, got my master's in math. KW: At the University of Michigan? KW: What was it like working in California? Was it once again a lot of men and you were one of the few women? FH: It was fun. Yeah, there were a lot of men and I was one of the few women, and I did mostly mathematical stuff, trajectory calculations for instance. KW: What were the other women doing that worked there? FH: There were a few other women engineers also, in fact some of their top department heads were women, so it wasn't a big struggle. KW: You had said in your survey that you liked your graduate years better than your undergraduate because you felt more comfortable with men. Is that kind of what happened in California? Is that where that happened? FH: I suppose so, yes. KW: Can you describe, I mean what do you mean by "more comfortable around men", like the shyness kind of disappeared, or...? FH: Well, like I could do as well as they were doing and I didn't have to be so shy. KW: So, a little more confidence in your own ability? KW: So, you went back and did your master's, what was that like? Were you still one of the few women? FH: Um, I can't remember. KW: Yeah? No it's okay, I can't even remember what I ate for breakfast yesterday, so I understand. So, a master's, is that two years? Listen to Frances describe her graduate student job working on missile trajectories. KW: I guess if you don't mind talking about your professional career, what did you do after you finished your master's? FH: Oh, well, that was the good part. I had a job while I was going to school getting my master's. KW: Oh, okay, what were you doing? FH: Engineering, aeronautical engineering. Mostly at that period we were working on trajectories for guided missiles that either the Germans were going to launch at us or that we were going to launch at them. KW: Okay, just to stop you for a second, would you feel that the Cold War played into your work? FH: This was before the Cold War. KW: Wait, this was in the '40s or early '50s? FH: Yeah, the late '40s. KW: So, that was your job while you were working as a graduate student? KW: And were you still working with a lot of men? FH: Yes and some of the women you already interviewed. FH: Yes, Marilee Kelley I worked with and Mildred Denecke and Irma Wyman. That's all I can think of right now. I think there were a couple others. We all did a lot of the same stuff to start and then we all kind of branched off into our own interests. KW: You worked with them while you were a grad student, correct? KW: Was there kind of a camaraderie then, meeting other women who were engineers and getting closer? FH: Yeah, we were all friends. Listen to Frances discuss her career path after earning her master's degree. KW: So, when you finished your graduate studies, what was your next job then? FH: I stayed in the same job and did some different work. I guess I transferred into a different department. KW: What were you doing exactly? FH: Well, pretty much the same thing. Then we worked on putting the trajectories in practice and getting them easier to calculate and of course during that period the fellas in part of our group were working on computers, great big frame computers. KW: Yeah? What was that like? FH: Dull. It really was dull. And Irma went on, she was very interested in it, she went on to become a vice president of Honeywell. I don't remember the exact department she worked in, but she did some very important stuff. Go to Denecke, you'll find her fun to interview; she's a great skier; she still skis. KW: Oh really, wow. Did you play any sports during your college years? FH: No, we played football that one day, you know, that mud well game, but that was all. I skied later. I took that up when I was in California, some of the people who worked at the North American were skiing and asked me to join them, so I went up skiing with them. KW: Oh really that's neat, it'd be neat to ski there. So, what was the name of the company you were working for in California? FH: North American Aviation in Los Angeles. KW: And where were you working in grad school and afterwards? 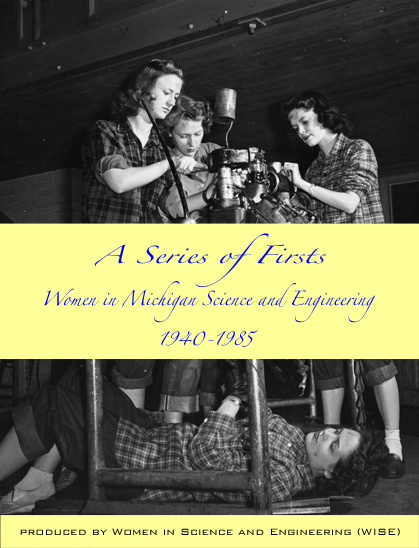 FH: In grad school I was working at the University of Michigan Aeronautical Research Center. KW: Okay, and you said you worked there after you finished graduate school too? FH: Yeah, the same place. KW: How long were you there for? FH: Oh, about four or five years maybe. And that's where I met my husband. KW: Oh okay, and did you keep working after you met your husband? KW: Did you stay and work at the same place? FH: Yeah, we stayed at the same place and after a year we went down and taught at the University of Toledo, and then came back. And after we came back, he was still working for the University of Michigan Aeronautical Research Center and I worked for Bendix when they started a division here. KW: Okay, what did you do there? Listen to Frances talk about her husband, children, and second career as a teacher for both the local high school and the University of Toledo. KW: How did wanting to have a family affect your career? Did you eventually stop working to raise your daughters? FH: Yeah, I stopped working and we adopted two girls. KW: Oh okay, where did you adopt them from? FH: The Lutheran Social Services. KW Oh, okay that's really neat. Couple more questions. So, your husband clearly had no problem with you being an engineer or anything since he was an engineer, I'd imagine. Was that nice to be able to share that? FH: He was my boss. KW: Oh really? That's funny. Can you tell me a little about that? FH: Nothing, just that we went out a couple times and became more interested in one another. KW: What about your children? One works in the hotel business and what does the other daughter do again? KW: Oh okay. How do they feel about you having had a career in engineering? Are they pretty proud? FH: Because after we went to Texas for a couple of years where he worked on the space program there. He's worked a lot in infrared technology. What was I going to say about Texas? After we came back, I did some teaching and then I did some substitute teaching in high schools and that was fun. KW: What did you like about teaching? FH: Oh, I liked the kids. It was fun. KW: So, you taught a little bit at the University of Toledo and did you also teach in high schools? FH: Afterwards, yeah. After we came back here. KW: Okay. What did you teach in the high schools? KW: Okay, did you teach math at the University of Toledo or engineering classes? KW: Okay, which did you like better? The college teaching? FH: Engineering, yeah it was great. You learn so much more when you're teaching a class. Particularly math, you know you have to get in-depth, not just skimming over the top of it. 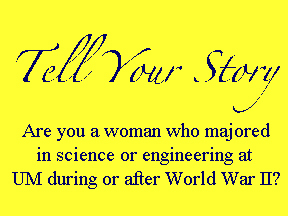 KW: When you were teaching engineering at the University of Toledo, do you know roughly what years that was during? FH: Oh dear, about 1950 I suppose. KW: So, I guess what I'm getting at is were you teaching mostly men then? Were there that many women in the classes you were teaching? FH: In Toledo, they were all men. KW: Oh really? Did they still treat you though with the same respect they would treat any professor would you say? FH: No. No, some of them were really terrible. KW: Oh really? Can you tell me a little bit about it? FH: Well, you hear so much about how a man's home background is reflected in what he does, whether he's unkind or cruel. And some of these kids, if they didn't get a good grade, they'd let me know about it. KW: Oh really, how'd you deal with that? FH: Well, somebody always came to my rescue. They'd say, "If you can't speak nicely you just get out." So, my colleagues were very helpful. It didn't happen but a couple times, that's all. KW: So, were the high schoolers a little better behaved when it came to their math grades? FH: Oh they were fun. They were fun to teach. KW: What made them so fun? FH: It was not a life and death job for them going to school, so they weren't so serious about their grades. The kids at the University of Toledo were very serious about their grades, which made it a little hard. KW: You were working, doing engineering for awhile, so was teaching your last job before you retired? FH: It was after I retired. I retired when we got our children. KW: When was that, do you remember? FH: Sure, it was 1965. KW: How long did you teach for, like substitute and high school teaching? FH: I think it was after they were in college even. KW: Oh okay. Did your husband to continue to work then as an engineer? Listen to Frances describe how she made friends with her male subordinates at Bendix, despite their first reaction to her leadership. KW: How were you treated overall in the workplace? Did any incidents ever occur because you were a woman? I mean you talked about in college that you had a professor that said you should be studying a cookbook, did you ever encounter things like that in the workplace? FH: Oh yeah. 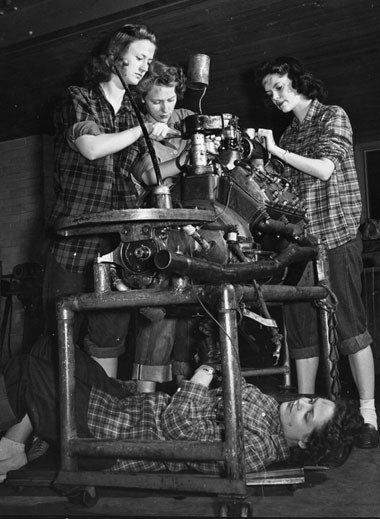 It used to happen fairly often, particularly when I was working at Bendix, because I'd be in charge of a project and assigned a man to work on the project, and some of them had been in the service, and they were really male dominant ingrained. So, it was hard to work with them at first, but then it worked out pretty well. KW: What did they act like? FH: Well, nothing you could do was right. "This isn't the way we do it, blah, blah, blah." But we got to be good friends so it wasn't a problem. KW: What about in other jobs that you had? What about in Califomia? You said the men treated you fairly well or did you ever encounter any sort of unfairness? FH: Oh, I was too low on the totem pole to even be considered then. KW: Do you think it was more then when you gained authority over men? Can you tell me any other incidents of men not respecting you or treating you poorly or differently in the workplace? FH: It just happened a couple times. I don't remember any of them. KW: So, overall, you'd say it was a pretty positive experience? KW: It's hard for people today to understand what it must have been like being one of the very few women, so I guess reflecting overall on your college experience, your graduate experience, and your work, would you say that it was fairly positive, being a woman? FH: Oh yes, I think so. KW: You didn't really feel that you had any major setbacks or anything? Listen to Frances describe the impact the Cold War had on her life. KW: This is kind of going back to earlier, but you working in during the '50s and early '60s doing some engineering work, did the Cold War have any effects on that? KW: That's funny. So, was the communist scare a pretty serious matter then at that time? FH: Well, it was only that you'd be accused of being a communist that was the only scare. KW: How did you feel about the people who had been accused? You talked about your boss. FH: I didn't really know them that well, but we were always constantly being interviewed about some friend or someone we worked with to see if they were communist, so it was uncomfortable. KW: Yeah. I would imagine it would be pretty strange. I read about in school that students would practice hiding under their desks in case there was a nuclear attack. I mean, being an engineer, were you really concerned that this was a genuine possibility that the Soviet Union could attack us? FH: We did just practice runs under the desk, just like you would for a tornado watch, but not anymore than that. KW: But did you feel scared? KW: Okay. Very interesting. So, the Vietnam War then you were raising your daughters, correct? KW: Did the Vietnam War stimulate engineering that much? KW: Did you know anyone that was sent to the war? FH: No, I don't, not that I can think of. Listen to Frances's advice for young women engineers. KW: What kind of advice would you offer to women in the field today? FH: Just to enjoy it. I don't have any particular advice except to keep plugging along, that's the best you can do, and don't get discouraged. KW: Can you remember any times that you felt particularly discouraged when you were either studying or working, when you thought, "I don't know if I can do this. I don't know if this is right for me?" FH: Not that I remember, but if I actually were to go back to that time, it might be different. Your memories are mostly positive, fortunately. KW: Yeah, we're trying to block out those bad memories. Listen to Frances discuss the problem of age discrimination in engineering. FH: Well, yeah, I think there is one thing that is going to come to the surface more and more, but more than the discrimination against women in engineering is the discrimination against age. KW: Can you tell me, why do you think that? FH: Well, I think that in the jobs that I got later on, this was after Bendix and before I subbed teaching, that in the application the age mattered a lot more. KW: Oh really? So, you think they're trying to, I mean that younger, fresh out of college engineers have a better chance than an older more experienced engineer? FH: I think so, if they're a woman yeah. KW: Why do you think in particular if it's a woman? FH: Well, it's two strikes, one being a woman and two being older. KW: Yeah, I see what you're saying. That's interesting. I guess I hadn't thought about that. FH: Well, people don't when they're younger. KW: Did you experience that at all? FH: Just when I was looking for a job. I answered some ads in the Ann Arbor News and was interviewed very enthusiastically and then after they consulted with each other they decided no, that I was too old. KW: Oh really? Was this after you had raised your daughters? FH: While I was raising them, I think. KW: Oh, so you wouldn't have even been that old really. That's weird. FH: No, I was older. Remember I was older when we got our children. KW: Okay. How old would you say? KW: But even then though that's surprising. I'm glad you said that because I would have never thought. FH: It's something that they never bring up until women's seminars.